molly moon's homemade blog: molly moon's is coming to u village! molly moon's is coming to u village! in case you haven't heard the news, molly moon's is coming to u village this fall! we're pretty darn excited, and hope you are too! the currently-under-construction south building of u village will be our new home away from home. it looks like we'll be opening in november, but don't worry, we'll keep you posted on the opening date. promise! this shop will have the same old molly moon's commitment to making delicious ice cream onsite with 90% of ingredients coming from the Pacific Northwest and using only 100% compostable products. like all the other shops, this one will create living-wage jobs and offer 100% paid health and dental insurance for employees. can't wait to see you there! 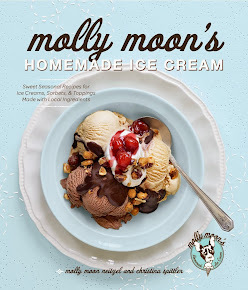 oh yeah, we've got some ice cream gossip: here's your update on what's in season at molly moon's! is made with local blackberries from Remlinger Farms and oil of Bergamot (best known for giving Earl Gray tea its unique flavor). this flavor came to be because molly loves quirky flavor combos and alliteration. that's a win-win in our book! fig ice cream is made with black figs that have a soft, berry flavor with a bit of earthiness. figs naturally pair with vanilla and anything rich. so we just had to mix 'em in with our 19% butterfat ice cream and some organic vanilla. watermelon mint sorbet is made with local watermelons! this is one of our favorite ways to end summer - a simple treat that's light, fresh and fully local - the mint is from Washington, too. all that, and it's vegan to boot. and guess what ... we're still scooping vegan coconut chunk! this creamy vegan delight (made with organic coconut milk, organic coconut flakes and chunks of Theo chocolate) is so wildly popular that we just can't bear to take it off the menu. This is fabulous news! Can't wait.